6 shows in Tôkyô (Kabukiza, National Theatre, Meijiza, Nikkei Hall), 1 in Toyooka (Eirakukan), 1 in Kumamoto (Yachiyoza), 1 in Kyôto (Minamiza) and 1 tour (Shôchiku Ôkabuki Tour)! Living National Treasure Onoe Kikugorô, Living National Treasure Nakamura Kichiemon, Matsumoto Kôshirô, Nakamura Tokizô, Onoe Kikunosuke, Nakamura Shibajaku, Kataoka Gatô, Nakamura Kinnosuke, Nakamura Kaishun, Ichikawa Somegorô, Onoe Shôroku, Ichikawa Sadanji and Ichikawa Danzô perform at the Kabukiza ! Living National Treasure Sakata Tôjûrô, Nakamura Kanjaku, Nakamura Baigyoku, Nakamura Hashinosuke, Nakamura Senjaku and Kataoka Takatarô perform at the National Theatre! Ichikawa Ennosuke and the Omodakaya guild perform at the Meijiza! Young and talented actors perform at the Eirakukan! Kataoka Ainosuke and young actors are on tour (Shôchiku Kabuki Tour)! Ichikawa Ebizô performs at the Nihonbashi Mitsui Hall and at the Minamiza! These programs commemorate the 32nd anniversary (33rd memorial service) of the passing away of Matsumoto Hakuô I. His two sons, Matsumoto Kôshirô and Living National Treasure Nakamura Kichiemon, are the zagashira. Kotobuki Shiki Sanbasô: Okina is the oldest ritual in the Nô theater. This Kabuki version shows Okina, an old man who symbolizes eternal youth, his attendant Senzai and the vigorous Sanbasô, who perform dances solemnly for good fortune. Sanbasô dances vigorously, stamping and shaking bells, praying for agricultural fertility and prosperity for all. This dances features 2 Sanbasô (Ichikawa Somegorô and Onoe Shôroku), 1 Okina (Kataoka Gatô) and 3 Senzai. Ii Tairô: Ii Naosuke was the head of state in Japan in 1860 when there were pressures from inside and outside the country. Imperial loyalists demanded that the Shôgun step down and hand over rule to the emperor to resist the foreign barbarians. The United States and other countries insisted that Japan open its doors. On March 3, at the snow-covered gate to the Shôgun's castle, Ii Naosuke was assassinated by imperial loyalists. 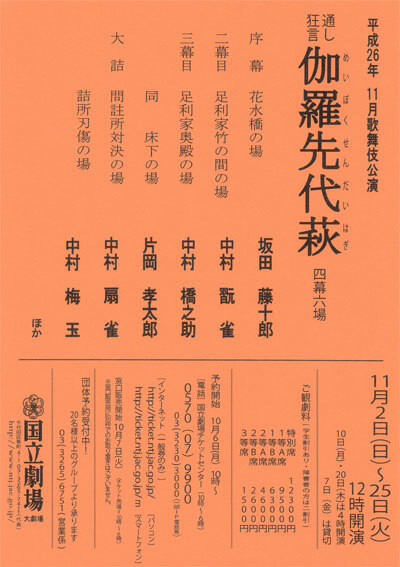 This modern play by Hôjô Hideji features the last day before the assassination as Naosuke senses that his end is near. The deaths of an old friend and his newborn daughter make Naosuke and his mistress Oshizu think back to simpler times before he was burdened by such responsibilities. Starring Living National Treasure Nakamura Kichiemon as Ii Naosuke, Nakamura Shibajaku as Oshizu and Nakamura Karoku as Naosuke's Zen teacher. Featuring also Onoe Kikunosuke, Nakamura Kashô, Nakamura Kinnosuke and Nakamura Matagorô. Kumagai Jin'ya: this play is a dramatization of the clash between the Genji general Kumagai Jirô Naozane and the Heike warrior Taira no Atsumori at the battle of Ichi-no-Tani, one of the most famous passages of the epic "Tales of the Heike". In the Kabuki version, on the cryptic orders of the Genji leader Yoshitsune, Kumagai hides the enemy warrior Atsumori and has his own son take the warrior's place. On the battlefield, Kumagai has to kill his own son in Atsumori's place. Things become worse when his wife Sagami and Atsumori's mother Fuji-no-Kata arrive at his camp. In the highlight of the play, he tells them the story of his mortal battle with Atsumori, keeping Atsumori's well-being and his own sacrifice a secret. He then shows the head of Atsumori for inspection by his leader to see if he has interpreted his orders correctly. This performance stars Matsumoto Kôshirô as Kumagai, with Nakamura Kaishun as Kumagai's wife Sagami, Ichikawa Komazô as Fuji-no-Kata, Living National Treasure Onoe Kikugorô as Yoshitsune and Ichikawa Sadanji as Midaroku. Gozonji Suzu-ga-Mori: The young samurai Shirai Gonpachi (Onoe Kikunosuke) is ambushed near the execution grounds of Edo on a dark night, but he manages to escape after a gruesome but humorous fight scene. He is watched by Banzuiin Chôbê (Onoe Shôroku), an Edo boss, who is impressed with his fighting skills and agrees to give him shelter in the city. This meeting between the handsome young Gonpachi and the heroic Chôbê is one of the most famous meetings in Kabuki. Kanjinchô: probably the most popular Kabuki play today, it includes dance, comedy and the heart-warming pathos of a band of heroes during their last days. Disguised as a band of traveling priests the fugitive general Yoshitsune and his small band of retainers are stopped at a road barrier. They escape only through the quick thinking of the head retainer, a warrior priest named Musashibô Benkei, who improvises the text of an elaborate imperial decree. Having escaped danger Benkei and the others describe their days of glory and hardships on the road to escape in a moving dance. This program stars Ichikawa Somegorô in the role of Benkei for the very first time in his career, with Living National Treasure Nakamura Kichiemon and Matsumoto Kôshirô as Yoshitsune and the barrier keeper Togashi. Sushiya: this is one act of an epic originally written for the Bunraku puppet theatre. The full-length play shows the fate of various Taira generals in hiding after the victory of their enemy, the Genji. In this act, Koremori (Nakamura Tokizô), the heir to the Taira clan is hiding in a sushi shop disguised as a humble apprentice, and Osato (Nakamura Baishi), the daughter of the house, falls in love with him. However, Gonta (Living National Treasure Onoe Kikugorô), the evil son of the house plots to gain a reward by turning in Koremori to the top Genji general Kajiwara (Matsumoto Kôshirô), but in the end, he has a surprising change of heart in one of the most heart-rending scenes in Kabuki. Also featuring Ichikawa Sadanji as Yazaemon, the proprietor of the sushi shop. Meiboku Sendai Hagi: this play is about the attempt to take over one of the most famous samurai households in the Edo period, a scandal that caused a sensation in its day. Hanamizubashi: the daimyô Yorikane (Nakamura Baigyoku) has fallen in love with a courtesan and has neglected responsibilities, causing high ranking retainers to plot the takeover of his domain. Returning from the pleasure quarters, he is attacked at Hanamizu Bridge, but is able to escape thanks to the help of a sumô wrestler retainer. Take-no-Ma/Goten: Masaoka (Living National Treasure Sakata Tôjûrô in "Goten"; his son Nakamura Senjaku in "Take-no-Ma"), a loyal maidservant, is taking care of the lord's young heir. Afraid he will be poisoned, she refuses to let anyone see him who might try to assassinate him. She even fixes his meal in her quarters using her delicate tea ceremony implements to cook rice. The plotting faction does not give up, though, and sends poison in the form of candy as a present from the Shôgun. Masaoka's son sacrifices his life for the young lord by eating the poisoned candy, and when he is killed, she thinks only of protecting her lord. Her fierce devotion to duty convinces the plotters that she is on their side. Masaoka's actions help save the young lord, and only when she is alone can she grieve for her son. With Nakamura Kanjaku as the villainous Yashio, a court woman who kills Masaoka’s son. Yukashita: Another faithful retainer Otokonosuke (Bandô Yajûrô), stands guard underneath the room, but the evil Nikki Danjô (Nakamura Hashinosuke) appears as a giant rat, but then slips away, walking calmly through the clouds. Taiketsu/Ninjô: the elderly Geki (Bandô Yajûrô), a faithful retainer, brings charges against Danjô. Danjô cleverly protests his innocence, but his lies are seen through by the wise judge Katsumoto (Nakamura Baigyoku). Condemned to death, Nikki tries to take his revenge on Geki. Takatoki: the last Hôjô regent in the Kamakura period was arrogant and given to pleasure and in this play we see him mocked by a band of flying tengû goblins. First performed in 1884, this is one of the most famous of the "Living History" plays (katsureki) that replaced the fantasies of Edo Period history plays with a new attention to historical accuracy. Starring Ichikawa Ukon as Takatoki. Onna Danshichi: a usual practice was celebrated female impersonators to have famous male roles rewritten for them. 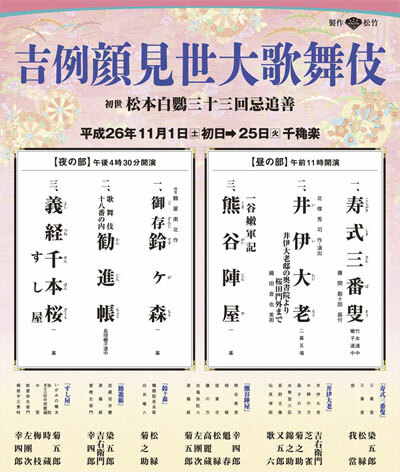 Numerous titles of already popular plays to which the character onna (woman) was added appeared in the Kabuki repertory over the centuries, such as "Onna Narukami" ("Female Narukami") or "Onna Shibaraku" ("Female Shibaraku"). "Onna Danshichi" ("Female Danshichi"), was a kakikae kyôgen of the famous Ôsaka drama "Natsu Matsuri". This parody was created by Sakurada Jisuke III and actions/characters were shifted to Edo. The female Danshichi is no more of fishmonger in Ôsaka but the Edo geisha Okaji. She is nicknamed Danshichi-jima Okaji (as she wears a kimono with the stripes pattern of Danshichi) and she plays the role of the guardian of a couple of young lovers, Tamashima Isonojô and the courtesan Kotoura. Isonojô is looking for a precious sword and Okaji helps him in his search. After a memorable fight, she also becomes friend with another tough geisha named Otatsu (the equivalent of Tokubê in "Natsu Matsuri"). Okaji, a real onna date, does not hesitate to strike his mother-in-law, Giheiji's old rag Otora (the equivalent of Mikawaya Giheiji in "Natsu Matsuri") in order to help Isonojô. Starring Ichikawa Ennosuke, Ichikawa Monnosuke, Ichikawa Shun'en and Bandô Takesaburô in the roles of Okaji, Isonojô, Otatsu and Otora. Shitennô Momiji no Edoguma: in the Edo period, actors were under contract to the Kabuki theaters for one year and the year began in November. This month of performances was called the kaomise or "face showing" production and always featured a newly written play which was a kind of loosely structured pageant to show off the new stars. This month at the Meijiza features revival by the Omodakaya guild of a kaomise drama made by Tsuruya Nanboku IV. This is, on a grand scale, a historical spectacle combining larger-than-life heroes, beautiful women or fantastic creatures (a fox spirit for example) to bring the golden age of Kabuki back to life in the middle of nowadays Japan. It uses the sekai of the demon quelling general Minamoto no Yorimitsu, also known as Raikô and his famous four warriors (the shitennô). Raikô and his men fight against the spirit of the Earth Spider or the warrior Sôma Tarô Yoshikado, son and heir of the rebel Taira no Masakado. This play is full of spectacle (keren) and marvelous incidents. Starring Ichikawa Ennosuke in 4 roles! This is the 7th Kabuki program at the Eirakukan, a renovated traditional theater built in the city of Toyooka (prefecture of Hyôgo). Obiya: one of the most famous love stories in Kabuki is the love of the young girl Ohan for her middle-aged neighbour Chôemon, finally culminating in a love suicide between the two. This month at the Eirakukan features the drama leading up to the romance between the two. Chôemon (Kataoka Ainosuke) is the proprietor of an obiya (a kimono belt shop) and his wife (Kamimura Kichiya) is very understanding, but the pressures of his family and the lustful jealousy of the boy apprentice next door (Nakamura Kazutarô) finally drive Chôemon and Ohan (also Nakamura Kazutarô), the beautiful young daughter of the family next door, together. This eventually leads to tragedy. Starring Nakamura Kazutarô in two contrasting roles, this play is a specialty of the Kansai style of Kabuki. Kôjô: the close relationship between the actors and the audience is shown by these stage announcements, lavish ceremonies to commemorate various important events. Kô no Tori: this is a newly-created dance-drama which focus on the oriental stork, a bird symbolizing the Hyôgo Prefecture. Kô no tori literally means "bird of god". Featuring Kataoka Ainosuke, Nakamura Kazutarô, Kamimura Kichiya and Kamimura Kichitarô. A special Autumn tour sponsored by the Shôchiku! Keya-mura: Rokusuke (Kataoka Ainosuke), a sword master who lives a simple country life, is taking care of a small foundling child. He hangs the boy's kimono outside his house in the hope that the boy's relatives will see it and know where he is. One day he finds himself attacked by a woman named Osono (Nakamura Kazutarô) who turns out to be the aunt of the child. As they talk, they find that they are in fact linked by promises of marriage although they have never met directly. Osono is searching for Kyôgoku no Takumi (Ichikawa Omezô), the killer of her father, Rokusuke's master, and Rokusuke promises to help in her vendetta. the mortar and pestle used for pounding rice cakes and dumplings are a symbol of a happily married couple. This short, lively dance shows a couple peddling dumplings with a series of songs and dances. Starring Kataoka Ainosuke and Nakamura Kazutarô in the roles of the husband and the wife. A special Buyô program starring the amazing Living National Treasure onnagata Bandô Tamasaburô at the Yachiyoza, a traditional wooden-built theater. The 3 dances are traditional Jiutamai dances. Kôjô: the close relationship between the actors and the audience is shown by stage announcements, usually lavish ceremonies to commemorate various important events. This month at the Yachiyoza, it is a stage speech done by Living National Treasure Bandô Tamasaburô. A masterpiece of tsuyamono (love story) which sings about the sentiment of love. It begins with description of a woman's heart toward a man she loves and her attachment is described gracefully with the sound of wind blowing through the pine trees, the cry of little cuckoos and the moon in the background which remind us of summer night. Bandô Tamasaburô plays the role of Lady Rokujô, the rival in love of Lady Aoi in Murasaki Shikibu's "Genji Monogatari". This dance is related to an episode in the novel in which Lady Rokujô is humiliated in public by Lady Aoi but is performed in a restrained chamber style. Kane-ga-Misaki: Bandô Tamasaburô appears as a beautiful young girl, expressing her love and feelings of jealousy. This is the same story as the colorful "Musume Dôjôji" dance, but is also performed in a restrained chamber style. The 16th Ôtemachiza stage performances at the Nikkei Hall in Tôkyô. Tsuru Kame: the crane (tsuru) is said to live for a thousand years, the tortoise (kame) is said to live for ten thousand years. Together, they are a traditional symbol of longevity. There is no particular plot to this play, but simply shows a visit by the empress to the Moon Pavilion where two courtiers dance as the spirits of the crane and tortoise. Starring Ichikawa Ennosuke as the empress, Ichikawa En'ya as the spirit of the crane and Ichikawa Kôtarô as the spirit of the tortoise. Akutarô: this dance is based on a comic Kyôgen play and was written for Ichikawa En'ô and was one of his specialities. This dance shows a wild drunkard named Akutarô (Ichikawa Ennosuke). He appears with a bushy beard and long halberd and waves it around wildly. But his uncle (Ichikawa Monnosuke) has a plan to cure him of drinking. Featuring also Ichikawa En'ya and Ichikawa Kôtarô. 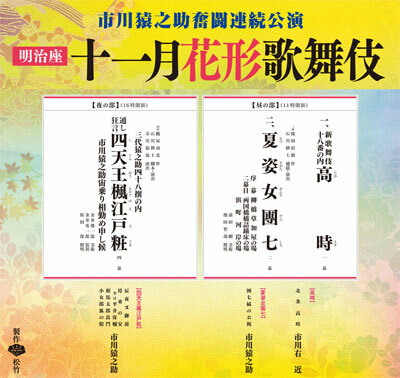 The first item of this program is a reading session of extracts from the "Heike Monogatari". The second item is the staging of the dance-drama "Otokodate Hana no Yoshiwara".